Welcome to the May edition of the Wacky Watercooler Blog Hop – this month we’re all about the “Retirement Blues”! Are you like us, and mourning the retirement of some of your favourite colours, stamps and designer series papers? I think as demonstrators, we get hit a little ‘harder’, since we don’t demonstrate products that we can no longer sell (well, sometimes I do, but that just gets you, my customers, frustrated! so I try not to do it anymore!). However, we do tend to hoard – er, keep – some of our most treasured sets, just like you. So today I’m sharing some of the sets and colours that I’m going to miss the most; let me know if mine are on your list, too! Before I get started – a bit of housekeeping – if you’ve never taken a ‘blog hop’ before, no worries, it’s easy peasy! All of our blogs are linked in a circle, so that as long as you keep going in one direction – clicking either ‘next’ or ‘back’, you’ll see all the amazing projects we’ve created for you. If you like to jump about at your leisure, just click the ‘home’ button, and there you will find the list of all the participating blogs, with links you can click to visit. Okay – we’re off! My first card is a quick & easy one; which is why I loved this Chalk Talk stamp set so much – making tags & cards with it was so easy! The good news is that the Chalk Talk Framelits are NOT retiring – so that means that there will be a new stamp set to coordinate with them! Yay!! In this card I also used several of the retiring colours; I used Baked Brown Sugar cardstock for the base, and a panel of Lullaby Designer Series Paper. On top of that is a piece of Coastal Cabana cardstock, embossed with the Modern Mosaic embossing folder (which is NOT retiring, but the coordinating stamp set & punch are!). I stamped the sentiment in Hello Honey onto Whisper White cardstock, and used the Chalk Talk Framelits to die cut it using the Big Shot. I added knotted Hello Honey and Coastal Cabana ribbon, and some Neutrals coloured Candy Dots to finish off the card. My next card uses one of those stamps sets I mentioned earlier – you know, the kind that I’m going to hoard keep, even though it’s retiring! Everyone who knows me, knows that coffee is my thing! So when SU! came out with Perfect Blend, it was serendipity! I saw this great new fancy fold, called a ‘corner fold’ on several different demonstrators blogs, and I just had to try it out – such fun 🙂 (if you Google ‘corner fold card’, you’ll come up with several video tutorials). The card base is Coastal Cabana, layered with Basic Black and Whisper White cardstocks. I stamped the cup images in Crumb Cake ink first directly onto the panel, then several more times onto scrap Whisper White, so that I could cut out the separate pieces to then layer them back together. The DSP I used for the sleeves is from the Sale-a-bration Best Year Ever pack. I then used the Gorgeous Grunge stamp set (not retiring – thank goodness!) in Crumb Cake to make the coffee drips. I stamped the sentiment onto Whisper White, and used the Curly Label punch for it, and layered it onto a piece of Coastal Cabana also using the same punch. I layered these onto a piece of the Natural 5/8″ Chevron Ribbon. 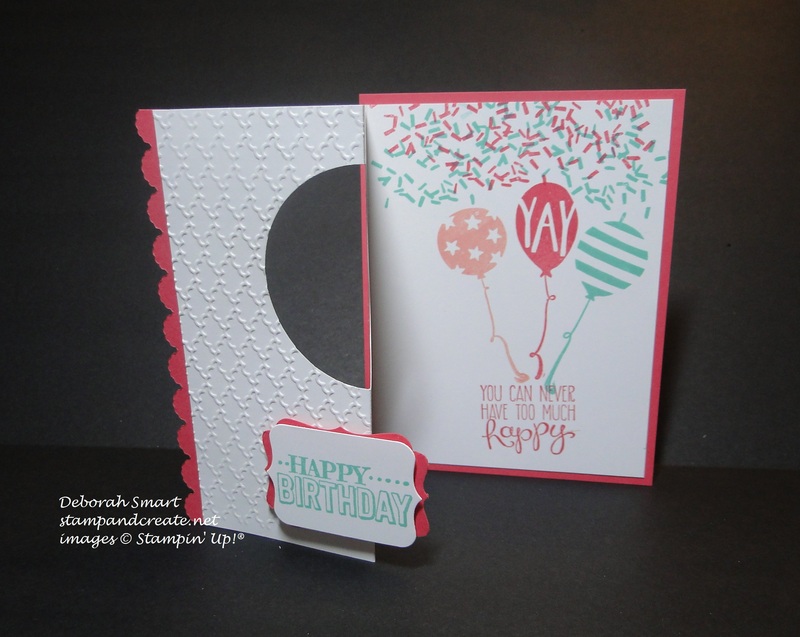 This next card was also quick to pull together, using a two-step stamp in 2 different ways. This beautiful Stippled Blossoms set is so gorgeous – and so versatile, I’m really going to miss it (or am I? hee hee hee!) Here I used 2 of the retiring In Colours; Strawberry Slush and Pistachio Pudding. On a panel of Whisper White cardstock, I created my own background using the detail image flower stamp in Strawberry Slush ink. It reminds me of a beautiful toile pattern, don’t you think? On a scrap piece of Whisper White, I then stamped the background/solid flower image in Strawberry Slush, stamping off once, first. Then using the ink full strength, I stamped the detail image on top, to create the full beautiful flower. I stamped 2 of the leaves in Pistachio Pudding ink, using the same technique of stamping off once for the bottom image, then full strength for the detail/top image. 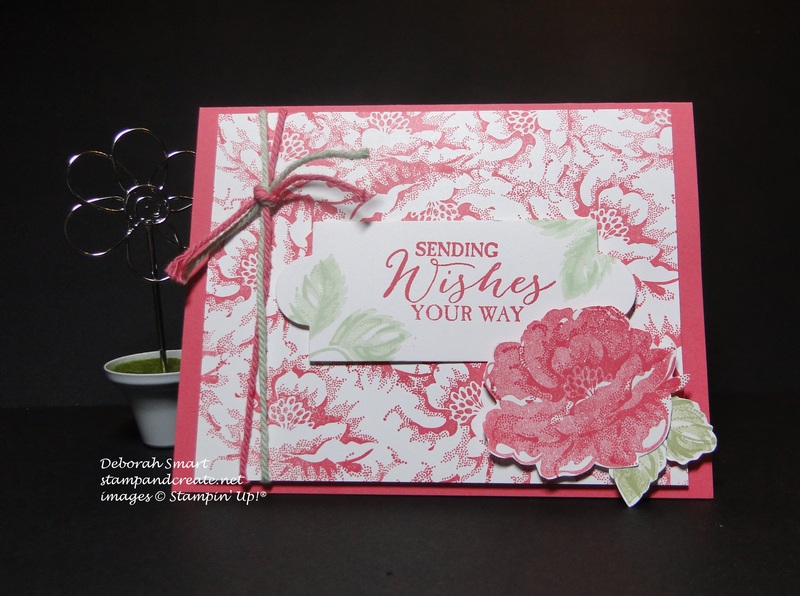 To create the sentiment, I stamped it from the Butterfly Basics stamp set (spoiler alert – not retiring! ), then stamped just the base image of the leaves in Pistachio Pudding. I then die cut it, using the Big Shot with the retiring Apothecary Accents Framelits. Thick Baker’s Twine in Strawberry Slush and Crisp Cantaloupe tied on the side finish the front panel, then layered onto a base of Strawberry Slush cardstock. Finally, this card uses a set that I know isn’t on the Retiring List, as it’s in the Occasions Catalogue, but having seen the new Annual Catalogue, I know it hasn’t been carried over – at least, not yet, anyway (which doesn’t leave me too hopeful that it will). I was lucky enough to have received this set when I attended the Stampin’ Up! Leadership Convention in January – it’s called Balloon Bash. I started with a piece of Whisper White cardstock measuring 9 1/2″ x 5 1/4″, scored at 2 1/2″ and 5 1/2″, then accordion folded. On the 2 1/2″ score line, I used the 2 1/2″ Circle Punch to punch out the aperture; the punch works even through 2 layers of cardstock, as the Whisper White is not as thick as our coloured cardstock. (if you’re using other cardstock, I would recommend using the Circle Framelits with the cardstock open). I then embossed just the front panel using the retiring Fancy Fan embossing folder. I then added the inside sentiment from the Yippee Skippee stamp set, which is also retiring. After stamping the inside, I added a back panel of Strawberry Slush measuring 5 1/4″ x 4 1/4″. To the front fold, I added a strip of Strawberry Slush cardstock measuring 1″ x 5 1/4″, and scalloped using the retired Adorning Accents Edgelits. The sentiment from Balloon Bash was stamped in Coastal Cabana on Whisper White, and die cut using the Chalk Talk Framelits, and layered on a piece of Strawberry Slush cardstock punched using the Decorative Label Punch. Well, that’s it for me! I hope you enjoyed seeing my projects, featuring some of my favourite stamp sets and colours. What will you miss the most?? I’d love it if you have time to leave me a comment, and let me know what you’ll be missing from the retiring products, and how you’re enjoying our blog hop! Now you’re off to visit my friend from Vancouver Island Stefanie Pletscher to see what she’ll be missing – just click the ‘Next’ button to go to her blog. If you’d like to head back and check out Jackie Susnick’s fabulous projects again, just click the ‘Previous’ button. If you’re not sure where you want to go, just click the ‘Home’ button to get to the Wacky Watercooler main blog page. Thanks for spending time with me today – enjoy the rest of the Hop! Previous Previous post: My Pre-Order Goodies Sneak Peek! Next Next post: Creation Station Blog Tour – New Product Sneak Peek! Three of my favourites also – Chalk Talk, Stippled Blossoms and Perfect Blend! Those will stay in my ever-growing collection of retired sets I can’t part with. Thanks for the ideas to CASE! Great minds think alike, Gail 🙂 I’m so glad we’re in this group together; thanks for sharing & caring! You used three of my all time favourites too Debra! Although they’re all wonderful, I’m in love with your Stippled Blossoms and Happy Birthday cards. Great use of the stamp sets. I also like all your fancy folds especially the last one. That is such a cheery card! Makes me smile. Thanks for sharing your endless talents! Thanks, Penny! It means a lot that you like my projects; yours are always so amazing! I’m so glad we’re in this hop together, my friend! I was going to use Chalk Talk too, but ran out of time! I am so glad I have the Perfect Blend set, it is one of my favorites. Of course, Stippled Blossoms is also a must have! I’m going to hoard, I mean keep, those set also! Great projects Deb, enjoyed them all! Ha ha! Yes, we do love to hoard – I mean keep – our favourite sets, don’t we, Marie?! 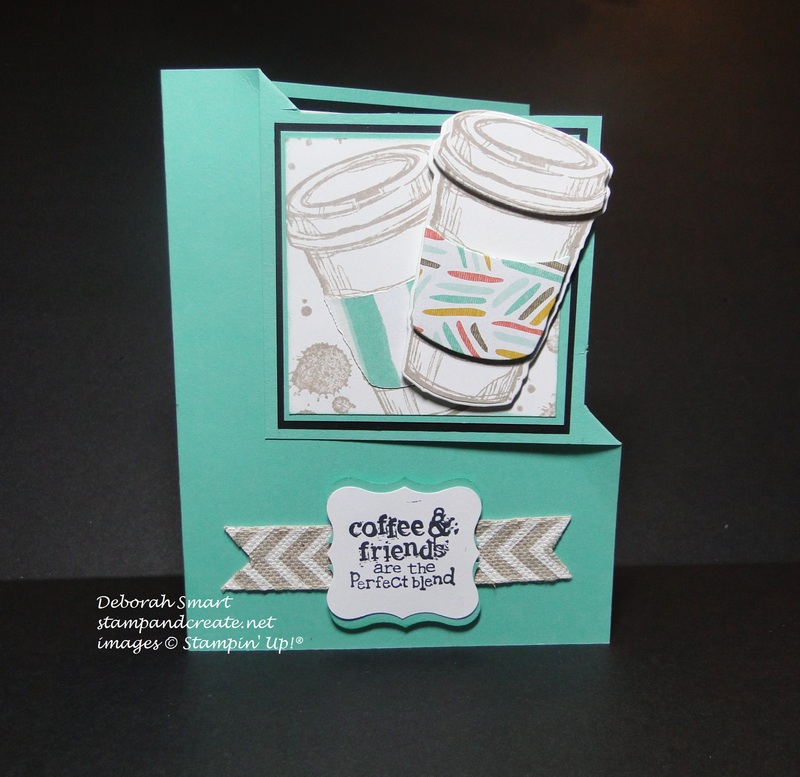 😉 I think enough of us love Perfect Blend that we could do a blog hop, just using that set! I always love seeing what you make! Aww, thanks, Kath! 🙂 I hope I didn’t disappoint on this one. The hardest part was choosing which retiring sets to use! I knew your creations would be wonderful. I am just wondering to myself why I never got Stippled Blossoms. That card is amazing. Love that Birthday card. I have decided to concentrate on birthday cards this year, of course that will change, but seems we are always in need of a birthday card. You definitely did not disappoint, you never do. Thanks for your kind comments,Christine! I regret no using the Stippled Blossoms more, now – but that’s always the way, isn’t it? Deborah, wonderful projects!! The Stipple Blossoms has got to be my favorite, but they are all great. Wonderful projects, Deborah! I especially love the Stippled Blossoms “DIY DSP,” and, of course, the Perfect Blend card. 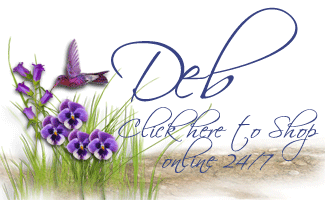 Hi Deb, thanks so much for continuing to be part of this wonderful Blog Hop. There is a recurring item in our blog hop that the majority of us will miss and that appears to be the Stippled Blossoms stamp set. The Perfect Blend runs a close second. I do wonder at the retirement of the latter because, although we have many new flower sets, we have nothing to compare with our Perfect Blend. It will be missed. I was surprised not to see the Balloon Bash in the new catalogue. The images are so happy and versatile, as you’ve aptly shown in your wonderful card. Nice work, Deborah! I love Perfect Blend, and I’m not a coffee drinker! 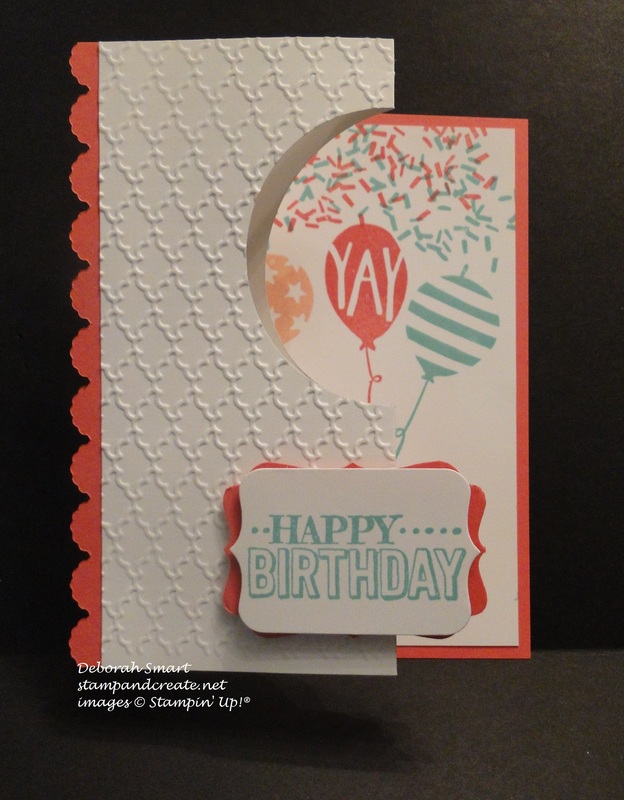 Your folded corner card is just “perfect”! And like you, I love Stippled Blossoms and barely used it–guess that’s why it’s retiring, hmmm?